KidsEBookBestsellers.com: J.K. Rowling: Returning to Kid Lit? No Kids' EBook Bestseller List would be complete without a Harry Potter book popping up from time to time. 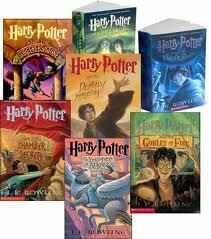 I've seen Harry Potter and the Sorcerer's Stone and The Complete Harry Potter E-book Collection on my chart. As I do with every author that shows up on the list, I dug around on the internet for some contact information and actually found J.K. Rowling's agency. I sent an interview request,and received a lovely response with kind words about the blog and apologies that Ms. Rowling didn't have the time, given her many commitments. Alas, no interview. But feast your eyes on this, dear readers. Yesterday J.K. Rowling spoke to over one million fans in a live webcast through Scholastic Inc. This 50 minute broadcast reached nearly a million students around the world and it's been posted at the Scholastic website. Here's the link so you can watch it! Perhaps the most exciting part is her admission that she will most likely be returning to children's literature for her next project. (She has made it clear in the past that the Harry Potter series is finished, so any new work will likely be a different story line.) So perhaps we'll see more of her books on the Kids' EBook Bestseller List. And who knows? Maybe someday I'll get that interview. A girl can dream! Read more about the Scholastic webcast at Sony.BroadcastNewsroom.com and at the Good EReader Blog. And check today's updated Kids' EBook Bestseller List to see all the TopTens in the top stores. Not only has it been updated with the latest bestsellers, but I've also added a new store to the mix -- EBooks.com. Enjoy!